It seems that every day we hear a new and frightening story about food allergies and the dangers that some foods pose to children. But what are food allergies, how dangerous are they, and is your child really at risk? It’s common to hear people say their child is allergic to something. But it might not always be the case. Just because your child’s body responds badly to a particular food, it doesn’t automatically follow that they’re allergic to it. When a child is really allergic to something, the suspect food triggers the immune system into releasing antibodies called immunoglobulin E. These cause the body to start releasing histamines, and it’s these that are responsible for all the unpleasant symptoms. How does a Food Allergy Differ from Food Intolerance? Sometimes, what you think could be a food allergy, is actually food intolerance. The symptoms, such as vomiting, stomach ache and diarrhoea can be the same for both conditions. But food intolerance doesn’t involve the immune system. Fruit is a good example. The natural acids in fruit can cause redness around your child’s mouth and all the natural sugars can cause diarrhoea, but these aren’t allergic reactions. Only about 3% of children suffer from food allergies. Childhood food allergies are most commonly found in children under four, and it’s babies who are the most likely to have an allergic reaction to food. Luckily though, most will outgrow their allergies as their immune systems develop. So, if your child is allergic to something when they’re tiny, it might be worth trying again when they’re a few years older. The exception to the rule is if your child is allergic to nuts or fish. These allergies, which can cause quite nasty reactions, often stick around for life. You’ll probably be particularly worried about food allergies, if you have a family history of bad reactions. Allergies often seem to run in families, so it’s a good idea to have a chat with your doctor if you’re trying to get pregnant, and new mums might want to cut the particular food groups from their own diet while breastfeeding. Don’t give your child dairy products until they’re six months old, and leave out wheat, cooked tomatoes and oranges until they’re at least eight months old. This is giving their immune system a chance to build up. When your child is ten months old, you can start to give them fish, nuts, berries, raw tomatoes and milk chocolate. Take your doctor’s advice before giving them foods other family members are allergic to. The symptoms of food allergies can look a lot like childhood illnesses – the kind of thing they seem to bring home from school every other week! Sickness and diarrhoea, runny noses, rashes and fits of sneezing could all mean a food allergy, but they could also be a tummy bug, influenza or a hundred other things. To find out if your child has an allergy, you’ll have to check with a doctor. Which Foods Might Cause an Allergic Reaction? Any food can cause an allergic reaction, but there are some ‘usual suspects’. Nuts, milk, eggs, fish, tomatoes and citrus fruits are often to blame. If your child is allergic to a particular food, watch out for other allergies to foods in the same family. And don’t forget to read the back of packets. Many foods, particularly soy and wheat, can be ‘hidden’ in veggie burgers, soups, ready meals, cakes and biscuits. Beware of paranoia though, most kids with an allergy don’t have multiple reactions, and you’ll only need to be vigilant for the one particular food. What Should you do if you Think your Child has an Allergy? As a responsible parent, you’ll be keeping an eye on what your child eats and you’ll soon notice any patterns forming. If you think your child might have a food allergy, start keeping a journal of what they eat, when and what reaction occurs. After a week or two, ask your doctor for advice. Don’t just panic and start cutting out food groups here, there and everywhere! You could be cutting out nutritious foods needlessly, as well as giving your child ‘hang-ups’ about ‘bad’ foods. Don’t dabble with diagnosis – always get your child checked out by the doc. If the doctor confirms your suspicions, the only way forward is to totally cut out the food in question. This can be a big challenge. You’ll need to read packets, keep a watchful eye when visiting friends and family and talk to your child’s school, nursery and, of course, their friends’ mums. It’s important to try to replace the nutrients found in the forbidden foods. If your child doesn’t eat dairy products, make sure they get their calcium elsewhere – green, leafy veggies are a good start, if you can get your child to eat them! Wheat is rich in B vitamins, so if you’re going wheat-free, top up your child’s amount of brown rice. Don’t forget, if your child is quite young, they might grow out of their allergy, and you won’t have to be the food police forever! Although most food allergies are unpleasant rather than dangerous, parents should always remember that in rare cases, an allergy can cause anaphylactic shock. If this happens, the child will have difficulty breathing, could collapse and, in extreme cases, even die. If you ever suspect this type of reaction, don’t wait, seek emergency medical treatment. Next time someone tells you not to give your child this or that food, remember there’s no need to worry. Allergies are not as common as some would have us believe and the symptoms are usually annoying, but harmless. 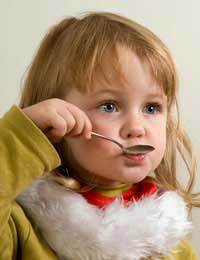 The main thing is to be aware of what your child is eating, noting any reactions, and talking to your family doctor.